This article is from a Science Fair 5th grade experiment display board we did here at Rosecomb Apiaries, spring 2015. 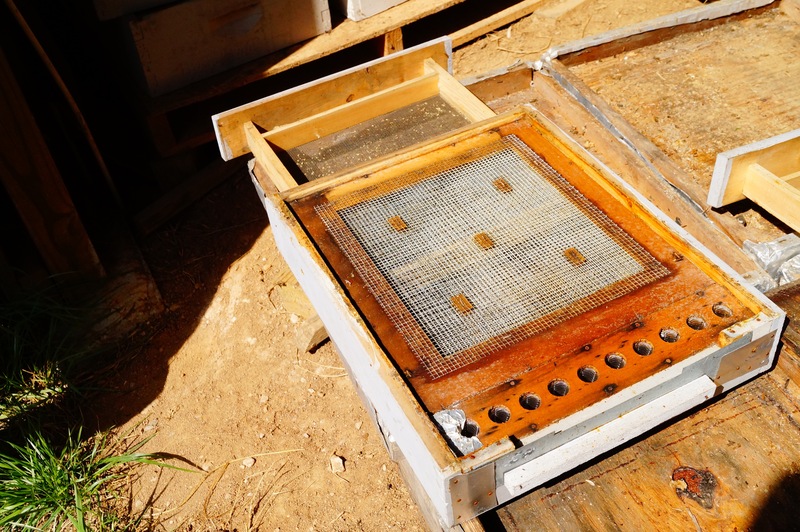 A pollen trap that replaces the normal entrance to a bee hive. My project is to determine if collecting pollen from honey bees will effect their honey production. 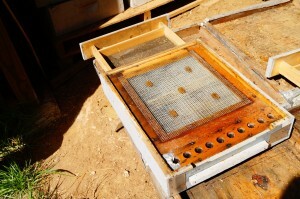 A drawer at the rear of the pollen trap allows the beekeeper to easily harvest it daily. Pollen is a food for the honey bee. It provides proteins for the honey bee. To get the pollen from the honey bee, beekeepers have to get things called pollen traps and it knocks some of the pollen off of the bee’s legs where they carry their pollen from the flowers. We studied sixteen colonies. We weighed each of the sixteen colonies before we began and estimated how many bees were in each colony. Then, we collected pollen from half of them using pollen traps. The other half did not have pollen collected from them. After nearly four weeks we weighed all sixteen colonies again and estimated the number of bees. We then looked for the differences to tell if pollen traps effect weight gain and population gain. 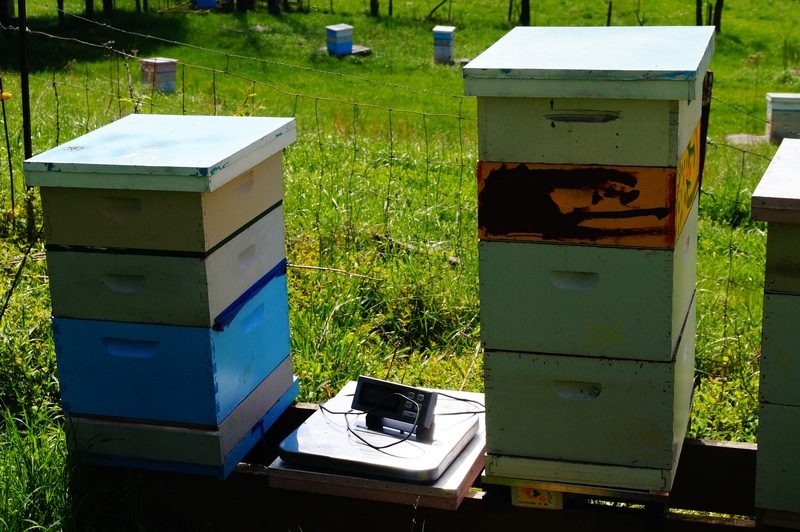 Colonies without a pollen trap faired a little better than colonies with pollen traps. Pollen is the main source of protein for the honey bee. The larva eat the pollen to grow into honey bees. Pollen is a form of honey bee bread. Pollen is produced by the stamen in a flower which is the male reproductive parts of a flower. People collect pollen because it’s very healthy. Also it helps with allergies. Nectar is another thing bees get from flowers to survive. Nectar turns into honey after it goes through the bees’ process of collecting, converting, and digesting the nectar. The colonies weight gain will mostly be from honey. 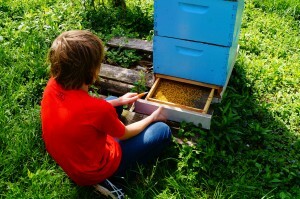 I think that collecting pollen will effect honey production in a negative way. We chose sixteen colonies with about the same strength. Then we weighed each one and counted the frames of bees in the colony. After that we put eight pollen traps in half of the colonies. After 2 weeks, we checked for swarming and removed any swarming colonies from the study. Then, after the full four weeks of the study (April 11th – May 7th, 2015) we weighed them again, counted the frames of adult bees, checked for at least one frame of stored pollen in each colony, and checked for swarming. One colony without a pollen trap (pictured right) was fitted with an electronic hive monitor from Beeinformed.org. It records weight and external temperature every 15 minutes and graphs it over time. Pictured between the two colonies is the scale we used to measure starting and ending weights of each colony. Frames of adult bees were converted to an estimate of adult bee population using the average number of bees that cover a frame. This allows us to account for different frame sizes. The formula used is AdultPopulation=(#MediumFrames X 1,570bees)+(#DeepFrames X 2,430bees). Finally we calculated weight gain and population gain in every hive to see if the colonies with or without pollen traps gained more weight and adult bees. More weight means more honey and bees. That is a measurement of how strong or weak the colony is. Therefore, I will know if the pollen traps affected the strength of the colonies. Two weeks into the study we found 2 colonies that were preparing to swarm. One had a pollen trap and the other did not. These were removed from the study because swarming would affect the resulting weight and population. After four weeks, every colony had at least one frame of stored pollen. One colony without a pollen trap was preparing to swarm, but had not yet swarmed. While one other colony with a trap had swarmed before we weighed it, therefore we noted which colony that was in Figure 1 and removed it from the results discussion. 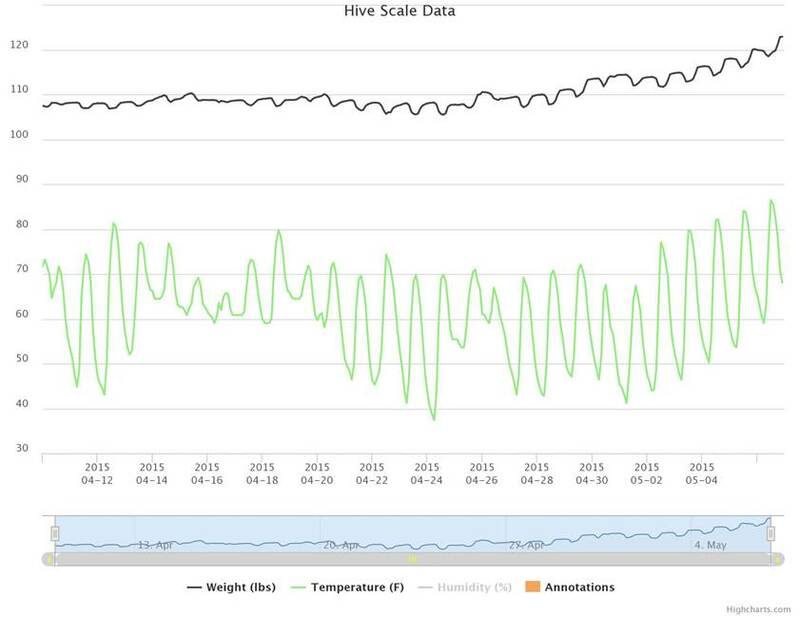 Figure 2: Hivescale graph from one colony without a pollen trap using hivescales.beeinformed.org. This gives an idea of the honey flow and weight gain experienced by a random colony during the experimental period. Weight (black line). All colonies in the study gained weight and increased in adult bee population during the 4 weeks. The minimum and maximum weight gain in colonies without pollen traps was 16.7 and 76.3 pounds. In the colonies with pollen traps the minimum and maximum weight gain was 2.5 and 29.2 pounds. The minimum and maximum change in adult bee population for colonies without pollen traps was 8,260 – 32,970 bees. For colonies with pollen traps the minimum and maximum population gain was 7,290 and 41,120 bees. To better show the differences in the groups of colonies we made a graph using Google Charts, see Figure 1. All colonies had at least one frame of stored pollen, therefore pollen trapping allows for some surplus pollen to still enter the colony and be stored for future use. Colonies are equally prone to swarm with a pollen trap than without. The final result was that the colonies performed better without a pollen trap. However, no colonies declined in strength with a pollen trap and some colonies without pollen traps performed worse than some colonies with pollen traps. Beekeepers should consider that pollen traps reduce honey production some, but allow for the collection of pollen. This does not seem to harm colonies because they still gained some in weight, population and were able to store pollen. Delaplane, K S; van der Steen, J; Guzman, E. 2012. Standard methods for estimating strength parameters of Apis mellifera colonies. In V Dietemann; J D Ellis; P Neumann (Eds) The COLOSS BEEBOOK, Volume I: standard methods for Apis mellifera research. Journal of Apicultural Research 51(5): http://dx.doi.org/10.3896/IBRA.1.51. Ellis, A., Ellis, J., O’Malley, M., and Nalen, C. Z. 2013. The Benefits of Pollen to Honey Bees. University of Florida Extension Bulletin: ENY152 (IN868), one of a series of the Entomology and Nematology Department, UF/IFAS Extension.